Those looking for a holiday camping site that provides enough comfort fun and entertainment to keep them happily on-site, but is also within easy reach of famously fabulous holiday playgrounds like Saint Tropez, Marina Paradise is it. Let LUX-camp secure your mobile home among the palms in this luxury camping site, and enjoy a camping holiday that creates memories that will have you yearning to return. Luxuriously large and well-equipped mobile homes amid a stunning landscape. Enough sports facilities to keep every enthusiast happy. Sparkling heated pools in which to float away those troubles. World renowned beaches and holiday fun on the doorstep. Mention Saint Tropez and thoughts immediately turn to white sandy beaches and an azure ocean dotted with luxury yachts filled with beautiful people. The luxury camping site of Marina Paradise is only 5km from this amazing playground of the committed sun worshipper. This means that renting a mobile home here gives campers easy access to the superb beaches of Pampelonne and Ramatuelle. If lazing on soft, powdery sand is not enough, then there is the thrill of jet skiing, sailing, water skiing, or diving to explore the wealth of kaleidoscopic life beneath the waves. Camping luxury begins in the mobile home rented via LUX-camp to suit individual requirements, but Marina Paradise does not only offer comfort and relaxation. Luxury camping here includes pool games, sporting competitions, karaoke, dancing and themed meals. For 6-12-year-olds there is also a kiddies club that provides loads of fun and entertainment. Then, of course, there is the unrivalled nightlife found at Saint Tropez for those who know how to party. For those who really enjoy driving and exploring, the coastal road leads to Nice, Menton and Monaco and all of the treasures for which these regions are renowned. 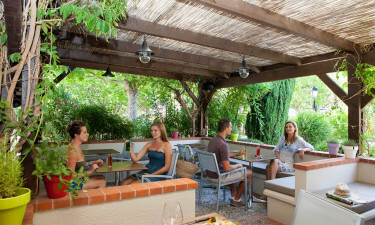 There are also charming Provencal villages waiting to be discovered and enjoyed for their unique cultures and traditions. The luxury camping site of Marina Paradise provides well for those voracious holiday appetites with bars, a restaurant and a pizzeria that will be happy to serve you on the spot, or provide great take-away dishes and tasty snacks. Again, campers here may want to explore the local and international cuisines offered by the top-class restaurants nearby, or sample the traditional fare in one of the quaint villages, while getting acquainted with the locals. Fine French wines are always a popular choice as accompaniment to a superb meal. The bustling marketplaces found in surrounding villages are the ideal places to shop for fresh local produce, as well as little knick-knacks to take home as reminders of a wonderful camping holiday. 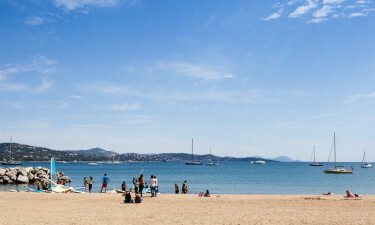 Souvenirs and necessities can also be purchased at the campsite, but with so many villages and the vibrant Saint Tropez beckoning, they make an exciting alternative.